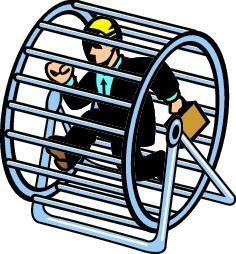 How motivated is the hamster running in his wheel? I don’t like running, I do it for the exercise, and the best part about running for me is when it ends. As usual I went running Saturday. Usually, I do 10 km in a circle because I hate going back the same way I came, so I try to plan a circuit I can do and that is achievable without turning back. Yet this Saturday my friend wanted to come along, and 10km is too much for her, so we agreed on going somewhere else where she could do a shorter run and I could complete the distance I wanted to do. It all ended up for me running around a couple of times a 800m circumference lake in the Ruzinov district in Bratislava. And it was extremely unpleasant. It was unpleasant because it was boring. And because it was boring, I found it physically harder to perform. And after the third tour and seeing the same swan on the shore, an image came into my mind: the hamster spinning in his wheel at the pet shop. How can you be motivated to do anything if you’re not moving! Well a hamster might be OK with it, but people? There is a saying in France “metro, boulot, dodo” which means in child speak “subway, work, sleep”. This illustrates a state of mind when boredom steps in your workday. When that happens, motivation is much harder to feel and performance goes down. There are many risks for a team to to fall into the impression that the days all look alike and that the work is always the same. It is quite a threat to the group in performance, spirit, and teamwork. Perhaps that’s why it is important beyond all these fun team building activities to keep alive with the team the notion that we are on a moving train and the landscape from the window is changing even if the interior of the train remains the same. It’s easy for a manger to be overwhelmed by daily tasks to forget these couple of minutes that can make such a difference. I occasionally myself realize at the end of the day that I took care of the team technically, but I did not manage to take those couple of minutes to point out how interesting the day, the week and the month is going to be. I’m glad my Saturday morning run reminded me of this.